All of the summery colors that I've been using lately make me long for spring. Seriously ... I can't wait for this awful on-again/off-again weather to go away and take my cold with it. 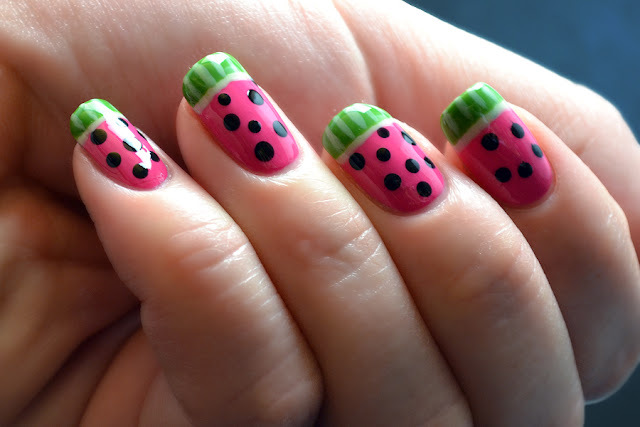 After my bumblebee manicure earlier this week, I decided to go the fruit route and do this cute watermelon nail art. It was surprisingly simple and I love the bright, cheery colors. The base is two coats of OPI Kiss Me On My Tulips (although the formula is thick enough that one coat would have worked). After that dried, I used my large and medium dotting tool to randomly place black dots of polish over the nail. Next, two coats of OPI Gargantuan Green Grape, followed by one coat of OPI Green-Wich Village just below, leaving a small strip of the lighter green. Once the darker green dried, I used a striping brush to add lines to the rind, adding definition.